Oh, dear. Events are hastening to their close, citizens. Mr. Dickens is pitting the forces of good and evil against each other, and ...I may have words with him about some of the ideas he has. I'm being reminded that this is a 19th century melodrama more with each passing chapter. I love that "sawyer" was once a verb. Lucie's poor brow is permanently ruffled, but Dickens seems to have written her into a state of Hallowed Purity yet again, as she waits and is Good and Kind and Patient and whatever other virtues you can shove into a sentence. Lucie doesn't spend a lot of time weeping and cursing her spouse's stupidity -- and possibly her own, for bringing her daughter into the land of death. Her father is the only one she cries to, and that, only occasionally, such a good girl is she. And eventually, her Goodness, Patience and Quietude is rewarded. Papa finds her a place to look at the prison so that Charles can perhaps see her. He's only maybe allowed there sometimes on every fifth Tuesday, but our girl is Good -- have I mentioned that? And thus she is there daily, without fail, dragging her child behind her. Of course, Lucie's routine gets noticed. My OED also mentions the carmagnole as a peasant jacket, and additionally, from the encyclopedia: The farandole is an open-chain community dance popular in the County of Nice, France. The farandole bears similarities to the gavotte, jig, and tarantella. The carmagnole of the French Revolution is a derivative. The "ding-dong, the wicked aristocrat is dead" dance really was danced in the streets. Dissent: not something well known during the French Revolution. Can you imagine declining this impromptu jig? "Merci, non, I prefer not to dance in the blood of my enemies in the streets." Eh? You say "non" to the line dance? Well then, off with your head... Oh, I can see I wouldn't have survived this. Lucie's father reassures her -- that wild heathen dancing scared wittle old her! -- and lets her know that Charles can see her, and she can blow him a kiss. Unfortunately, Madame DeFarge sees her blowing kisses but Lucie's being packed off anyway. Charles is finally going to be tried for his ...crimes. How long is Doctor Manette's eighteen years of imprisonment going to stand him in good stead? How long will he be enough to protect Lucie from Madame DeFarge's shadow? The chapter ends with another mystery: WHO do they meet at Tellson's who hugs Lucie in greeting? Who has come to Paris -- for heaven's sakes, who's left in England!? It had better not be Sydney. That's all I'm saying. In seasons of pestilence, some of us will have a secret attraction to the disease-a terrible passing inclination to die of it. And all of us have like wonders hidden in our breasts, only needing circumstances to evoke them. 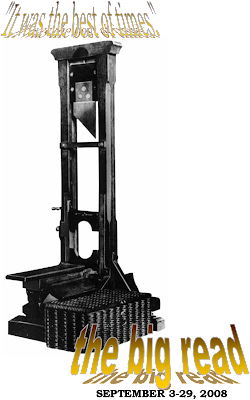 Unfortunately, the "passing inclination" of the season of pestilence passes; the guillotine is kind of permanent... That makes me really thoughtful. Doctor Manette has carefully, carefully coached Charles on the matter of his arraignment, and he comes through beautifully. Monsieur Gabette -- alive and unscathed -- emerges, and corroborates Charles' tale of why he was actually in the country, and voilá -- the fickle crowd loves him, and he pardoned. He goes home, the Child Bride faints, all is well. I admit myself somewhat bewildered disgusted as to why Lucie is seen to be guided through appropriate behavior. It's like watching a parent prompt a child. "Now, what do you say to your Daddy, Lucie? Can you say 'thank you for rescuing my husband'? Come on, honey, you can do it." Her father objects to her being weak and trembly, but so far, no one objects to her being a brainless idiot. Strange, that. Wonder where the DeFarges made off to at the end of the trial? What was with them glaring at the jury? Hmmm. If I'm ever held captive in a revolution, please just bring me Miss Pross. Although Miss Pross, through her long association with a French family, might have known as much of their language as of her own, if she had had a mind, she had no mind in that direction; consequently she knew no more of that "nonsense" (as she was pleased to call it) than Mr. Cruncher did. Hee! "Nonsense." Her employer only makes his living from teaching French, but it's nonsense to Miss Pross. I can hear her now saying, "Whatever," in a most crushingly dismissive way. Hee! Is it just me, or is Doctor Manette just a wee bit proud of himself? The phrase "I have saved him" from the last chapter grated on me just a teensy bit. And, since Dickens was a typical 19th century bloke, versed in Biblical literature, I think I can see the shape of things to come: "Pride goes before destruction," after all. Dickens isn't exactly subtle in his intentions, and as Miss Pross and Jerry Cruncher go out to do the shopping -- wisely varying their purchases and the neighborhoods in which they procure -- the redcaps come for Charles again. And now we know where the DeFarge family got off to -- Midnight Murder and Mischief -- or madness -- Central. And now Charles is going to Saint Antoine, to answer for his crimes again. Once again, Dickens has surprised the heck out of me. I've read this book before. Three times... but ages and years ago. And so, it's so much fun to go through and recall -- and be shell-shocked -- by the bits I've forgotten. First, Miss Pross finds her brother Solomon!!! And, none of us expect him to be loving -- she has a massive blind spot for the wee scunner -- but man, is he ungracious. No longer in prison, he's... an official in France!? Second, Jerry Cruncher seems to recognize him -- and asks him his name, says he was a spy at the Bailey!?!? And third shocker: Ol' Solly now goes by the name ...John Barsad!!!! JOHN BARSAD. THAT guy, whose name is embroidered in Madame DeFarge's quilt o'deadliness! Only, he's pretending to be someone else now? Eh? He's no longer English? It seems now that Mr. Carton knows... something. He sees through this "sheep of the prisons" and though I can't yet tell which side the blighter is on, Sydney knows. And the card game begins. And it Just. Gets. Better. Sydney Carton casts his mind back to the first trial in which Charles was accused back home, and remembers there was someone else with him, accusing Charles of being a spy. Barsad/Pross says, oh, no, that poor Roger Cly, he died. And Jerry Cruncher's hair stands on end! I had to look up the nursery rhyme to figure out what the heck Dickens was going on about a cow with a crumpled horn doing Jerry's hair. And then I remembered: the cow tosses things. Dogs, mainly. Jerry, who rather evasively does not own how he knows (he kind of suspects that Tellson's representative would not look kindly on his rabble rousing and desecrating graves), relates that the coffin which held the alleged remains of Roger Cly was filled only with paving stones and earth. He remembers his aggravation that night, and repeatedly states he'd choke the blighter for half a guinea. And, so, at last, John-Solomon-Pross-Barsad -- is nicked, as they say. He gives up. But the viewing of the card hands has been done before witnesses. Sydney wants the loathsome Solomon to have a few private words with him now. And my thoughts are now ominous, ominous, ominous indeed. And I say to you again, Mr. Dickens: don't try me, here. I will hate you for at least ten minutes if you do what I think you're going to do. If there's some awful Biblical scene about a man laying down his life for his friends, I will throw the book. And wail a little. Don't do it, Mr. Dickens! Tune in next time to see if Doctor Manette reverts to the shoemaking prisoner of the north tower, or if his strength continues; find out if Miss Pross bops anyone in the head with a handy wine bottle for speaking "nonsense," and learn if Mr. Cruncher's headquills raise any further, and make him the goblin he truly longs to be. Will this family will ever leave this benighted country in one piece?? ?